The problem lies in the fact that even degreed engineers typically only spent one or two classes on spring design and that was probably many years ago, making retention spotty at best. As a result, spring design has often been left to the spring companies. Every customer service representative has undergone spring design 101 here at Hardware Products. We do not put anyone on the phones until they are expert spring designers. We review their printouts before allowing the spring to go into production until we are confident they have learned the appropriate lessons. I first learned to design springs using a specially made slide rule. 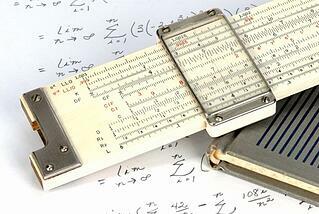 Most people do not even know what a slide rule is any more! For those of you who don’t know or have forgotten – a slide rule, also known as a slipstick, is a mechanical analog computer. Although it’s similar to a standard ruler in name and appearance, the slide rule is not ordinarily used for measuring length or drawing straight lines. With the advent of new technology, calculators made it simpler to split up the design formulas into individual equations. Then, when programmable calculators came along, the task became even simpler. And finally with the launch of the Personal Computer (PC), it was possible to design all of the formulas into one program and have the computer do all of the work. When the PC came along, Hardware Products programmed its own computers to take care of the many spring designs we performed. Consequently, the Spring Manufacturers Institute (SMI) commissioned a computer house to write a program for spring design. Even though we had our own design program we migrated to the SMI software so that we would have the distinction of having the Trade Group software instilled in our designs. Even though today’s software does an admirable job at designing springs, many people still would prefer to have their spring company design the spring for them. Having said that, there are also many engineers who have chosen to purchase their own software and are quite competent at designing a spring and sending that printout to us. 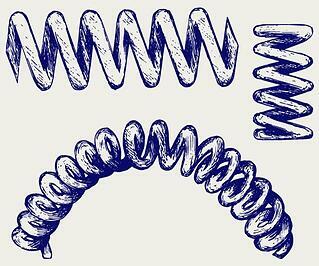 The spring engineer’s role has transformed quite a bit from designing springs to choosing the correct material. And that’s one question customers constantly pose us with–what would be the correct material to use in a spring design. The software does not choose what material you should use because the software cannot know the application. If a spring is to be used in a machine with oil all around it, the less expensive carbon steels may suffice. However, if corrosion is a possibility, then stainless steel may have to be used. And if seawater is present, the even more expensive type 316 stainless may be necessary. Regardless of whether you need spring design help or material selection help or even confirmation of your own design, Hardware Products is your one-stop shop for springs. Not only do we have multiple spring designers on staff, but we also know the best materials to be used for specific applications. And when a specialty material is needed, we have access within the industry to purchase that material for you. If you are stuck, just drop us a word. Our spring experts make it their business to solve your spring design problems.